This is the ULTIMATE Pizza Dough Recipe! This easy pizza crust recipe can be made thick, thin, or personal sized with whole wheat or gluten free flour. 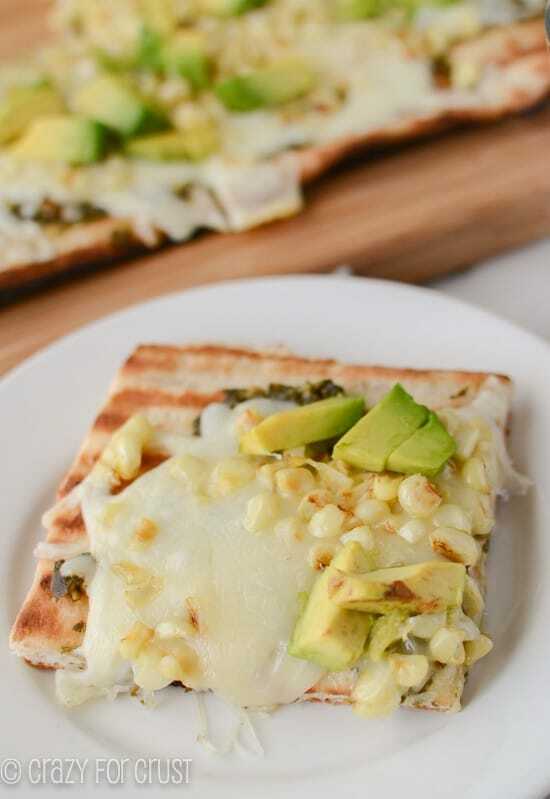 You can make a baked pizza crust or a grilled pizza recipe. 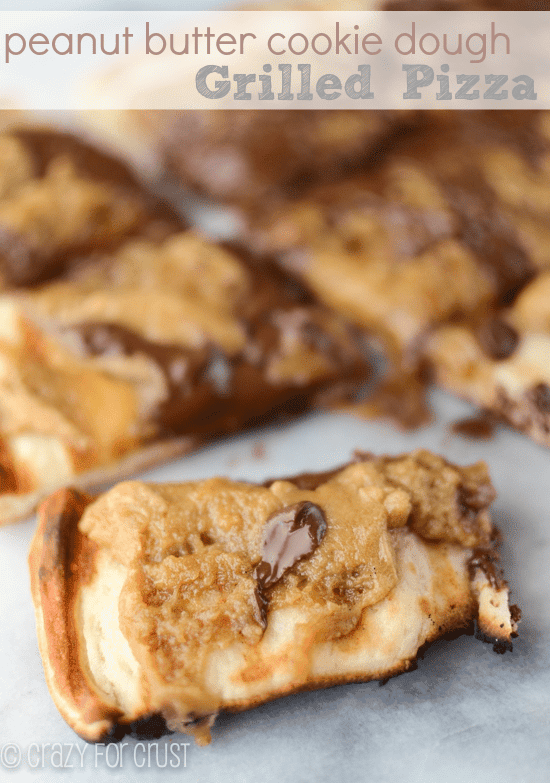 Top it with whatever you like for the best dinner, or make a dessert pizza! If I have one downfall in life, it’s carbs. If I was stranded on a deserted island and all I had was a loaf of bread and a bottle of wine, I’d be happy. You know what would be even better? CHEESE. Bread and cheese, and wine. And maybe a square or two of brownies. No joke, I could live on those few things at every meal every day for the rest of my life and then I’d die fat but happy. You know what you get when you add bread + cheese? PIZZA. I don’t even require sauce, but that makes it even better. When I was growing up we lived up the street from the BEST pizza joint in the whole world. (Seriously, at random times my mouth waters thinking of it. Like now.) At least once a week my dad and I would con my mom into getting a pie and we’d devour it. As an adult, I try not to eat pizza every week but I crave it that often (and more, like every day almost). Until I started blogging, I was terrified of yeast and making my own bread and pizza dough. It was so much easier to buy a tube of dough or a packaged already baked one, but those never tasted as good as take-out so I was always left wanting MORE. 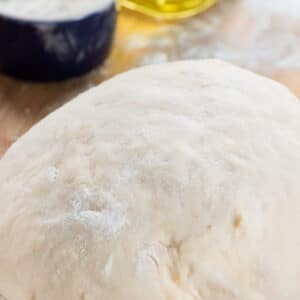 One day I tried making my own pizza dough and OMG >> life changing. 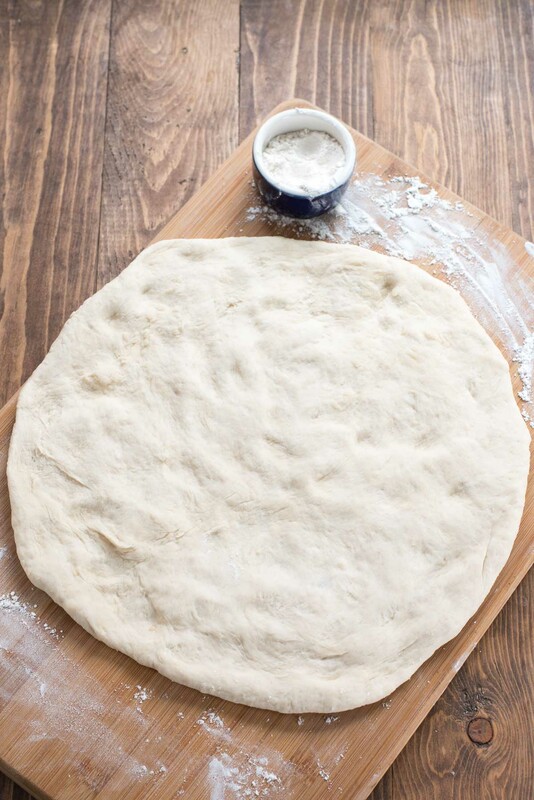 Making this homemade pizza dough recipe is so much easier than you think it will be. Get over your fear of yeast, okay? Once you have this recipe down, the world opens up. 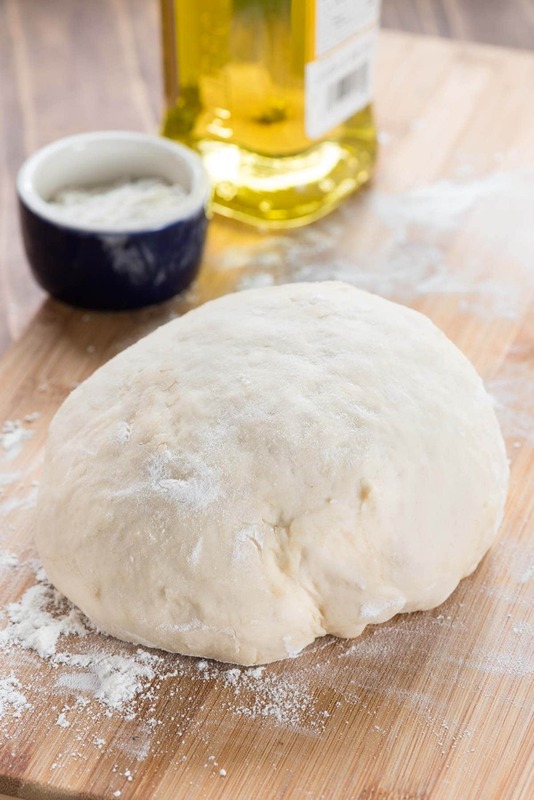 Pizza, flatbread, cheese breadsticks, dinner rolls…you name it, you can make it with this pizza dough recipe. Plus, if you make your own pizza at home YOU control the ingredients. There will be less calories than the pizza joint down the road, so you won’t feel as greasy and guilty afterward. 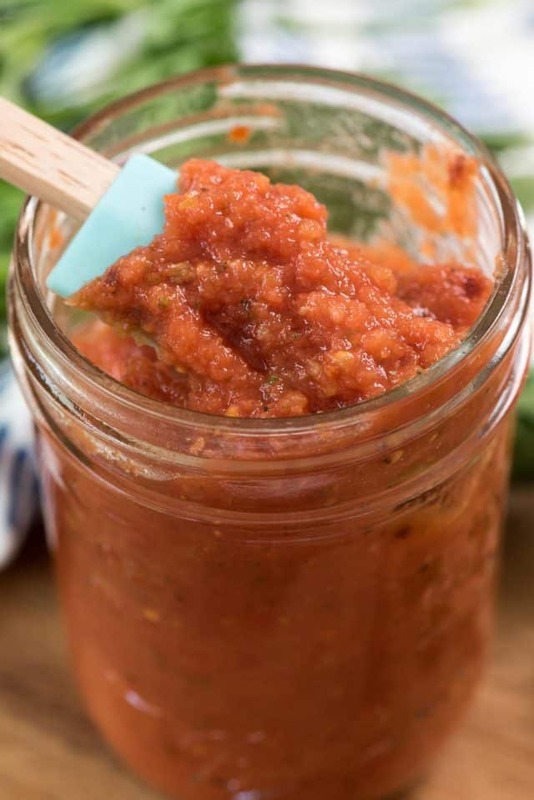 Be sure to use my Homemade NO COOK Pizza Sauce recipe too! Because you know you’re gonna go for that 4th slice. Don’t lie to me and tell me you can stop at just one…or two. Why is this crust the ULTIMATE pizza dough recipe? Because it’s SO versatile. Want a whole wheat pizza crust? Sounds good! Use white whole wheat flour instead of all purpose, or go half and half, using all purpose and regular whole wheat flour. What it gluten free? Great! Use a one-to-one gluten free flour that you can substitute for all-purpose. Want to make a thick crust pizza? Gotcha covered – this pizza dough recipe makes one 12″ puffy chewy crust. Wait, you like thin crust? Okay, perfect. Cut the dough into two pieces and make two 12″ thin crusts. Oh, hey, kids coming over for dinner? Cut the dough into 4-6 pieces for PERSONAL pizzas! THE SKY IS THE LIMIT with this pizza dough. What will YOU make with this pizza dough recipe?? What kind of yeast do you use for pizza crust? There are two kinds of yeast you’ll find at the grocery store and you can use either one BUT the recipe is different for each. Active Dry Yeast is what I’ve used for years. This yeast requires being “bloomed” before you make your dough. In essence, you’ll mix the active-dry yeast with hot water and some sugar and let it sit and ferment for a few minutes. Then you’ll add the bubbly mixture to your dry ingredients and oil. Active dry yeast dough requires a rising time – usually and hour or two – so that the dough doubles in size before baking with it. Fast Acting Yeast (aka Rapid Rise Yeast or another name dependent on brand) is just that: it works faster. There is no need to proof the yeast with the hot water; when using fast acting yeast you just add it to the dry ingredients. You then add the hot water to the dry ingredients and mix until the dough comes together. Another plus of fast-acting yeast: little or no rise time. Most of them just need to rest for about 10 minutes before rolling out. Do you need any special tools to make your own homemade pizza dough? I like using an instant read thermometer to make sure my water is the correct temperature. If you don’t have one, think hot bathwater when you touch it. A stand mixer makes the dough come together easily when you use the dough hook. Using a stand mixer just means you’ll have less kneading time by hand. I like using a pizza pan or pizza stone for baking my pizza. But you can just use a large cookie sheet as well. If your house is super cold it might take longer to rise, just for planning sake. If you’re making this gluten-free, know that the dough is not going to rise. I let mine sit, but the gluten doesn’t form, because, obviously. So instead you just press the dough into the pan instead of rolling it out. The end result is more like a crunchy crust/chewy cracker. On baking: if you want that crunchy bottom crust it is SUPER IMPORTANT that preheat your oven to 500°F and that you preheat your pan. Put the pan in the oven to preheat while the oven heats. Make your pizza on a parchment paper then carefully transfer it to the hot pan (on the parchment). It’ll sear the bottom to give it a browned and crunchier feel than if you just put the dough on the pan and bake it. Check out my video to see how easy this pizza dough recipe is to make! If I can make it, so can you. This is the ULTIMATE Pizza Dough Recipe! This easy pizza crust can be made thick or thin or personal sized with whole wheat or gluten free flour. It can be baked or grilled and topped with whatever you like for the best dinner (or even dessert). Measure warm water (between 100°-110°F) in a measuring cup, then add the yeast and sugar. Stir gently, then let sit until it’s active and foamy. This will happen within 5 minutes. If it doesn’t, your water may have been too hot or cold or your yeast may be old. It is important to use a thermometer to measure your water temp. An instant read thermometer is best but in a pinch a meat thermometer will do. Stand mixer preparation: add salt, oil, and 2 cups of flour to the mixing bowl. Attach the dough hook to the stand mixer. Stir the flour mixture gently while adding the proofed yeast mixture. Run the mixer on low speed until the mixture is combined and wet and then add the third cup of flour. The mixture should come together into a ball that is just a bit sticky. By hand preparation: stir salt, oil, and 2 cups flour in a large mixing bowl, stirring in the yeast mixture as you go, using a wooden spoon. Add the third cup of flour and then stir until you can’t anymore. Remove the spoon and then use your hands to work the dough into a ball that is slightly sticky. Spray a second large bowl with nonstick cooking spray, add your pizza dough ball, then spray the top lightly with cooking spray and cover tightly with plastic wrap. Place in a warm area of the kitchen and let rise until doubled in size, about 1-2 hours. Mix 1 cup flour with salt, sugar, and yeast in the bowl of a stand mixer. Set aside. If doing this by hand, just mix it in a large bowl. Measure warm water (between 120°-130°F) in a measuring cup. Add the oil. Add the liquid ingredients to the dry ingredients and mix with dough hook, scraping the sides of the bowl as needed, until a wet mixture forms. Add one more cup flour and continue mixing, then add as much flour as you need for the dough to come together in a ball (about 3/4 cup - 1 cup). If doing this by hand, use a wooden spoon until you can't anymore then get your hands in the bowl. Turn out dough onto a floured surface. Knead for just a few minutes, or until the dough comes together and springs back when pressed with two fingers. Cover and let rest for 10 minutes. Note: this pizza dough can make 1 thicker crust or 2 thin crust 10-12” pizzas, or 4-6 small personal sized pizzas. When ready to make pizza: turn out dough onto a lightly floured cutting board or a sheet of parchment paper. Sprinkle with more flour if needed so you can stretch and flatten the dough into your desired size. Cut parchment paper to fit the pan you’re using, hanging over just about an inch on all sides our circumference. Preheat oven to 500°F. Place pizza pan in the oven while the oven is preheating. Place your pizza dough on the sized parchment paper and top as desired. Once the oven is up to temperature, carefully transfer the pizza to the hot pan (be careful - pan is HOT). Cook until the cheese is melted and crust is slightly browned, 10-20 minutes depending on thickness, size, and toppings. Whole wheat pizza crust: Use white whole wheat flour instead of all purpose, or go half and half, using all purpose and regular whole wheat flour. Gluten free? Great! Use a one-to-one gluten free flour that you can substitute for all-purpose. The dough won't rise and will have a slightly different texture. 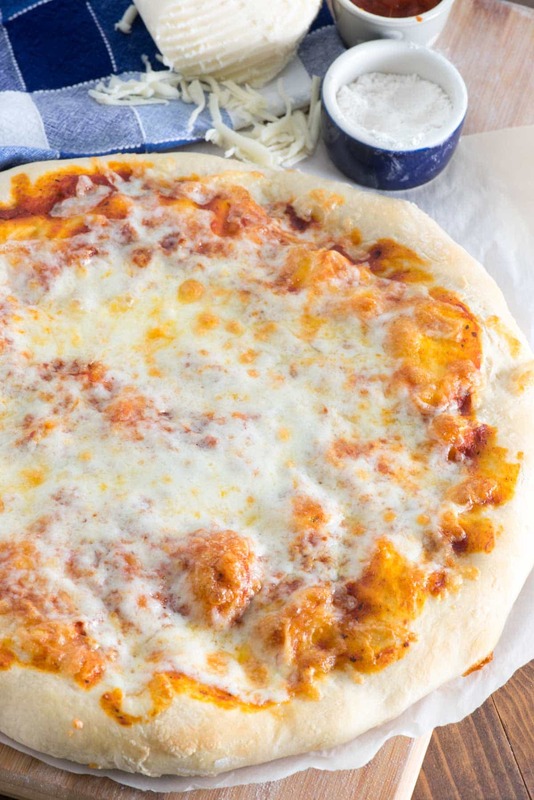 Thick crust pizza: this pizza dough recipe makes one 12" puffy chewy crust. Thin crust: Cut the dough into two pieces and make two 12" thin crusts. Cut the dough into 4-6 pieces for PERSONAL pizzas! Breadsticks? NO PROBLEM. Flatten the dough then slice into sticks. Fast acting yeast is called by different names depending on brand. Fleischmann's Yeast calls it Rapid Rise, for example. Awesome recipe. It’s the only one I use now. Thank you. I apologize, I am new to this– could you clarify for the yeast? You sort of rushed through it in the video. I am pulling from a jar, not an envelope. Does the recipe call for TWO 1/4 teaspoons?? Or– 2 full teaspoons, and then an additional 1/4 teaspoon? Sorry if this is a stupid question. Thanks!